Resin bound swimming pool surrounds are a designer’s dream. Because of its versatility and unique features, resin is now widely considered as the surface of choice for outdoor and indoor swimming pool surrounds. Highly decorative - Versatile and colourful, it’s a designer’s dream. By mixing colours and textures, you can define specific areas, create patterns, motifs and even logos. Cost effective - Life expectancy of more than 25 years if maintained properly. Fast installation – Resin can be laid onto many existing surfaces without the need to excavate or groundwork (provided the base is stable and structurally sound). A much safer alternative - Non-slip because of its optimum grip property; no sharp broken slabs or ceramic. Comfortable and smooth, resin bound gravel stays cool even when sun-drenched, so it won’t scorch your feet when you walk onto it barefoot. It’s a smooth, even surface with no loose stones. Low maintenance – It’s stain resistant and debris are easily washed away. You only need a quick power wash twice a year to keep the surface in pristine condition. Camouflage unsightly drains and filters with resin, too, so they can more easily blend in with their surroundings. Build ramps to improve easy access for pushchairs, cycles and wheelchairs. 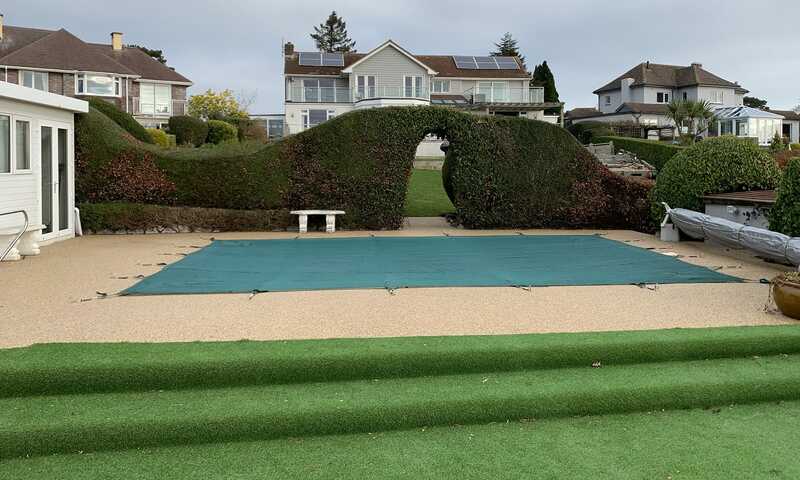 We design and install resin swimming pool surrounds throughout Devon, Cornwall, Dorset and Somerset.